Most recipes for tuna salad call for fat-filled mayonnaise, but this recipe uses Greek yogurt instead. You get all the creaminess without added calories to set back your results. 3. 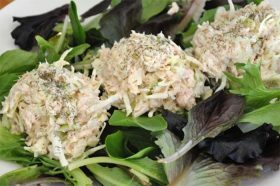 Arrange mixed greens on plates, then use an ice cream scooper to place the tuna mixture. Sprinkle with dill. One serving equals: 140 calories, 1 fat, 210mg sodium, 13g carbohydrate, 2g fibre, and 20g protein.